Three bedroom semi detached house in a sought after location which would be ideal for any first time buyer looking to get on the property ladder or any growing families. 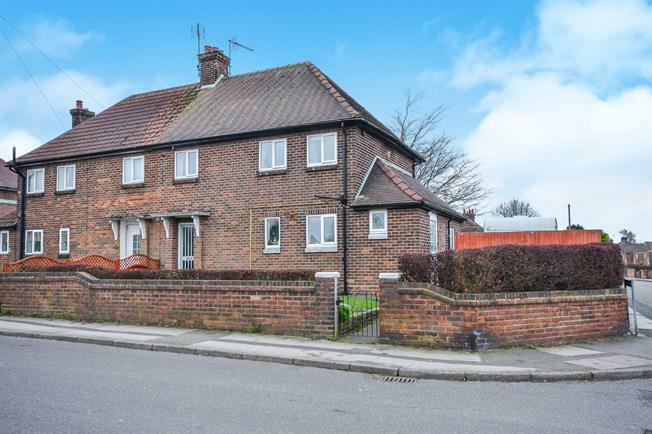 The property feels spacious throughout and is on a well established sized corner plot. The home briefly comprises of; an entrance hall, lounge, dining room, kitchen which leads through to a downstairs WC and a laundry/utility room. To the first floor are three double bedrooms all with built in storage cupboards and a family bathroom. Outside the property to the front is a front lawn section with paved section which leads to the front door. To the rear is a large well established garden which is mainly laid to lawn but also includes a large drive with detached garage, mature shrubs and decked/patio areas as well. A viewing is highly recommended to appreciate the size and quality of this property. Front door. Radiator, under stair storage. Double glazed uPVC window. Two radiators and electric fire. Two double glazed uPVC window. Radiator. Roll edge work surface, wall and base units, porcelain sink. Double aspect double glazed uPVC windows. Radiator. Roll edge work surface, wall and base units, space for washing machine, dryer. Double glazed uPVC window. Radiator, boiler. Standard WC, panelled bath, shower over bath, porcelain sink.